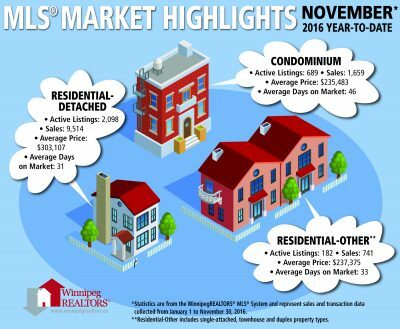 WINNIPEG – November MLS® sales activity was less than 3% off the best November ever in 2015 when it eclipsed 900 sales. 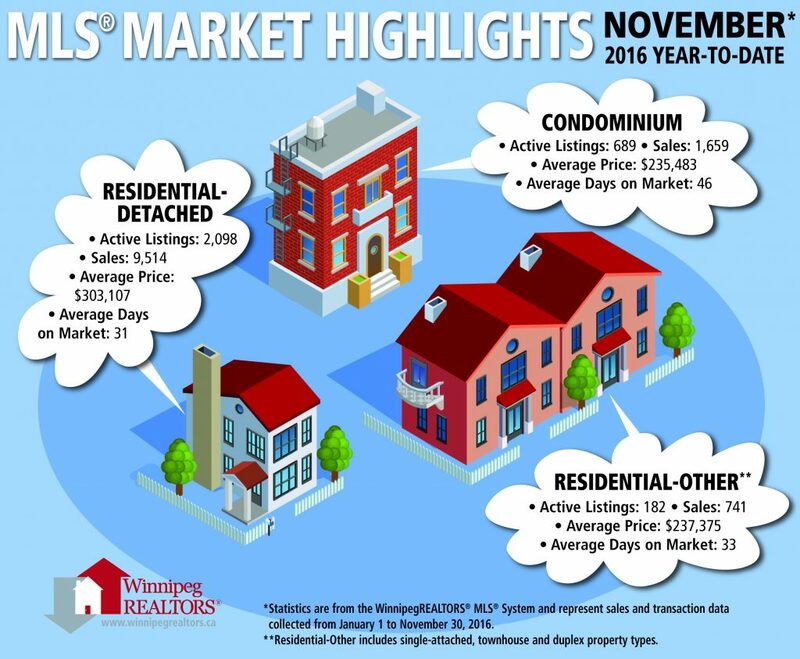 This solid result ensures the addition of sales in December to the November year-to-date total will usher in a new all-time annual sales record for WinnipegREALTORS®. It will replace 2007 as the top sales year ever in the association’s 113 years of operation. November sales of 877 were down less than 3% from November 2015 while dollar volume of $243 million was slightly below the $244 million transacted in November 2015. New listings entered on the MLS® of 1,374 in November were down by 3% from last year but well above the long term average. The two main property types went in opposite directions in November. Residential-detached or single family home transactions were down 7% while condominiums increased 8%. November is the first full month of sales activity since the federal government brought in tougher mortgage regulations. They require a lower debt-to-income ratio of 39 per cent and a higher stress test threshold to qualify for a home at the Bank of Canada rate of 4.64 per cent when putting down less than 20 per cent as your down payment. Year-to-date MLS® sales of 13,015 are up 6% over the same period in 2015 while dollar volume of over $3.6 billion has increased 8% over 2015. The year-to-date dollar volume figure has already surpassed WinnipegREALTORS®’ highest annual dollar volume total of $3.5 billion. MLS® inventory going into the final month of 2016 is sitting at just over 4,000 listings and is down 8% compared to the same period last year. The primary reason for the decrease is due to stronger demand for listings in 2016. In looking back on what has now resulted in an impressive year of consistently good monthly MLS® sales activity, Elston made the following comment. 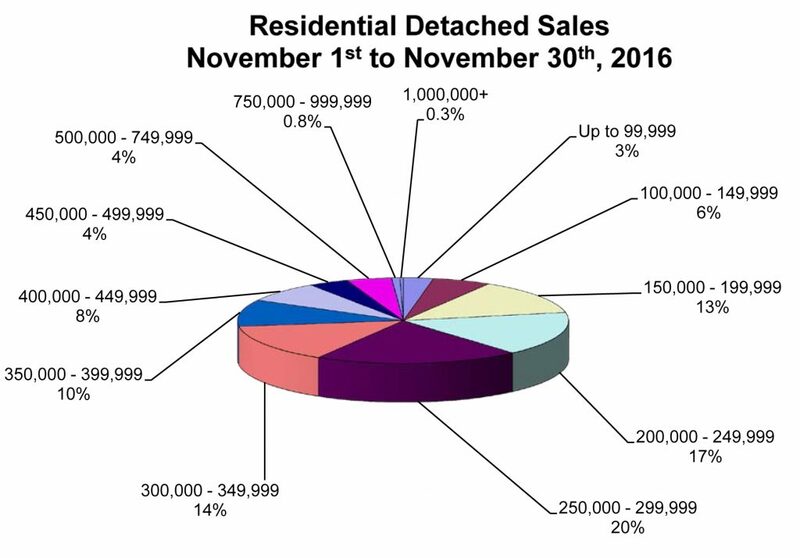 The most active price range for residential-detached sales in November 2016 was from $250,000 to $299,999 at 20% of total sales. Next busiest is the $200,000 to $249,999 price range at 17%. There were still 22% of total sales taking place in the three price ranges under $200,000. The average days on market to sell a home was 36 days, 5 days quicker than November 2015. The most active price range for condominium sales in November 2016 was from $150,000 to $199,999 at 22% with the second busiest price ranges of $200,000 to $249,999 and $250,000 to $299,999 both representing 16% of total sales. The average days on market to sell a condominium was 54 days, 5 days slower than the pace set in November 2015. Established in 1903, WinnipegREALTORS® is a professional association representing just over 1,800 real estate brokers, salespeople, appraisers, and financial members active in the Greater Winnipeg Area real estate market. Its REALTOR® members adhere to a strict code of ethics and share a state-of-the-art Multiple Listing Service® (MLS®) designed exclusively for REALTORS®. WinnipegREALTORS® serves its members by promoting the benefits of an organized real estate profession. REALTOR®, MLS® and Multiple Listing Service® are trademarks owned and controlled by The Canadian Real Estate Association and are used under licence.